Food Scientists apply their knowledge in biology, chemistry, physical sciences, and engineering to study the nature of foods, the causes of their deterioration, and the principles underlying food processing. They will also study all the technical aspects of food from harvesting or slaughtering to cooking and finally being consumed safely. Food Science is different from the field of nutrition. Students after SPM or O-Levels will join the Foundation in Science for 1 year before continuing on to the 3-year Bachelor of Science (Hons) Food Science with Nutrition programme at UCSI University or Taylor’s University. Both private universities are ranked Excellent or “Tier 5” in the SETARA 2016 ranking in Malaysia. The degree programmes are accredited by MQA as well. foods, the causes of their deterioration, and the principles underlying food processing. They will also study all the technical aspects of food from harvesting or slaughtering to cooking and finally being consumed safely. Food Science is different from the field of nutrition. A challenging programme, the study begins with an understanding of the biological and physical sciences as a basis for understanding the science of food and nutrition, as well as the relationship between nutrition and health. Students possessing an analytical, inquisitive mind who are interested in applying food science principles to further enhance the health and welfare of mankind, will beneﬁt greatly from this programme. Students who are good in Chemistry and Maths with a strong interest in sciences, can consider taking this course. Food Science is a relatively untapped career option with great future prospects. With the increased use of science and technology in food production, there is an increasing demand for professionals in this field. It is estimated by the United Nations that 800 million people around the world are undernourished, 400 million women of childbearing age are iron deficient and about 100 million children suffer from vitamin A deficiency which is a leading cause of blindness. Food Scientists can help these people through their expertise. Food Scientists have developed genetically modified rice that is fortified with beta-carotene which the body converts into vitamin A, and they are also working on other kinds of nutritionally improved crops. Food Scientists are the guardians of our food supply and they are responsible for converting the world’s harvest into safe, sanitary and appetizing food products. They are also inventors of new products and new methods of food processing and preservation. Through their efforts we enjoy a variety of safe and nutritious foods. physical and biological properties and interactions of food and their components. Food Scientists are also hired to perform research and to develop processed foods that have the right taste and consistency. Food Scientists apply the basic sciences, mathematics and engineering to converting agricultural commodities to edible food or beverages. Students will apply their knowledge of microbiology and biochemistry to find ways to improve the taste and nutritional value of our food supply. They will study the physical, microbiological, and chemical makeup of food. In addition to studying Chemistry, Biochemistry and Microbiology, students will explore subjects like nutrition, food biotechnology, quality assurance, waste management and even food and beverage engineering. Food scientists may also develop ways to process, preserve, package, or store food, according to industry and government specifications and regulations. Consumers seldom think of the vast array of foods and the research and development that has resulted in tasty, nutritious, safe, and convenient foods. Examples of the activities of food scientists include the development of new food products, design of processes to produce these foods, choice of packaging materials, self-life studies, sensory evaluation of the product with trained expert panels or potential consumers, as well as microbiological and chemical testing. The simplest example is the instant noodles where the noodles and its ingredients need to be dried but when hot water is added, it “cooks” and turns into edible food that is acceptable to our taste. Cheese is also another product that Food Scientists work on from processing the milk into cheese. As Malaysia grows and our food products become more in demand locally and overseas, the job demand for Food Scientists increase. Who knows, you may be hired to turn our famous Satay or Penang Char Keow Teow into microwaveable products. What do Food Science Graduates in Malaysia work in? The food industry is one of the largest manufacturing industries in the world and it provides great employment opportunities for food scientists and nutritionists to meet the ever increase consumer demand for food products that are both nutritious and convenient. Food scientists are generally involved in the area of research and development of products and processes, supervision of food manufacturing processes, which include production, quality control, quality assurance and food safety, as well as in food engineering support, marketing and sales, product support and promotion. 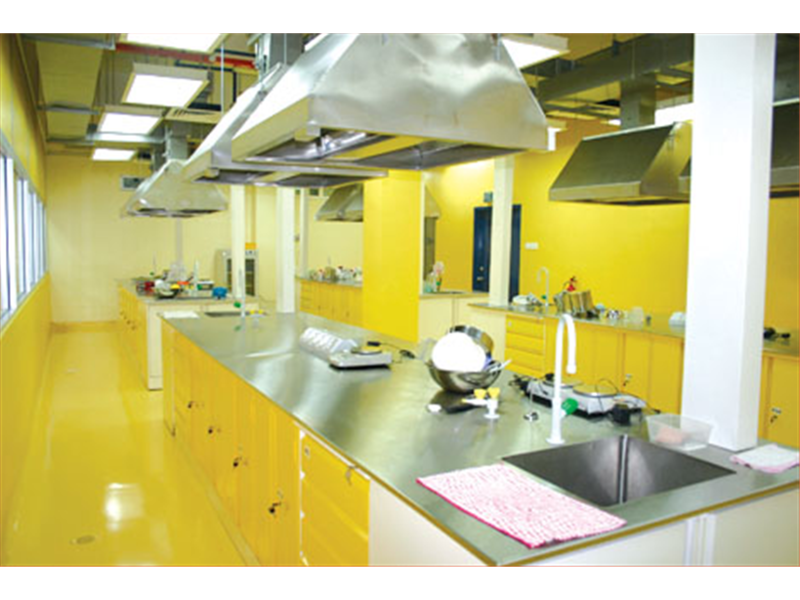 They may also work within consulting laboratories, government organisations and regulatory bodies as food scientists, food microbiologists, flavour chemists and food safety inspector. Food Science graduates are fully prepared for positions in quality assurance, product development, research, and technical services in a variety of industries and companies. EduSpiral helped me with my scholarship application, registration and took me on a campus tour as well. Food Science graduates are employed in management, process engineering, marketing, quality assurance and product development in a variety of food sectors which include the fish, meat and dairy industries, the brewing, baking and confectionery industries and service industries such as packaging, ingredient and equipment supplies. Job demand for Food Science professionals in Malaysia is high with so many Food manufacturing companies such as Kraft, Kawan Foods, Nestle, Lee Kum Kee, Maggie, F&N, Guiness Anchor, M&M, Gardenia, Carlsberg Brewery, Old Town White Coffee, Unilever Food Solutions, and more. Food Science processes are use to make sure that the taste, aroma, texture, colour and nutrients in food are maintained. All these start to decline as soon as raw food materials or ingredients are harvested or collected. Food Scientists will perform research and development to try to minimize this decline. Food processing is designed to remove health hazards associated with microbial pathogens. Pasteurization of milk is just one of many examples of processes that reduce the risk of food-borne illness and extend shelf life. Malaysians have become busy with the modern lifestyle therefore increasing the demand for easy to make foods to suit this lifestyle. A deficiency in vitamin D has caused Rickets, a common childhood disease. Food Scientists fortified milk and other products which has stopped this disease. Fortification of foods such as cereal, bread and pasta with folic acid, a B vitamin that helps make healthy new cells, has helped reduce the risk of serious birth defects. Commercial food manufacturing operations are more efficient in the conversion of raw materials into consumer products than home processing and preparation. Through life-cycle assessments of the environmental impacts of the food system, waste-management practices are being refined and improved further. The Malaysian government has identified the food processing industry as a priority for development as well as to increase exports. Malaysia is a food haven with our multi-cultural mix and there are nearly 3,200 manufacturers involved in the food manufacturing industry. This accounts for nearly 10% of Malaysia’s manufacturing output. In 2007, the food manufacturing industry reported an output growth of 7.5% with a sales value of USD5 billion. Malaysia produces processed foods that are exported to over 80 countries at an export value of more than USD2.6 billion a year. Malaysians now have more spending money therefore our eating habits have changed. Graduates from overseas have returned with an appetite for western and international cuisine. There is also a trend towards easy to cook or ready-to-eat foods with the busy work lifestyle of both husband and wife. All these contribute to the opportunities for food scientists to create ready-to-eat food that are safe, tasty, and nutritious. With the growth in the food industry, the demand for Food Science graduates is increasing. Graduates in Food Science can find work at Malaysian or multinational companies such as Nestle, Unilever, Cadbury, Coca-Cola, Cerebos, Campbell Soup, F&N, Mamee, Kawan, Eu Yan Sang, and many more. 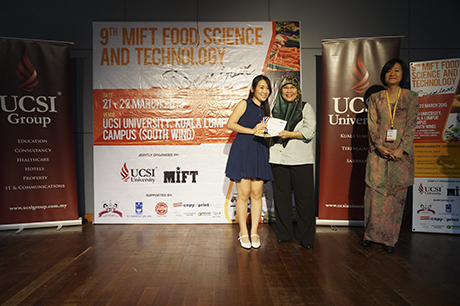 Cheong Ai Mun (left) receiving her first-place certificate from Dr Siti Noorbaiyah Abdul Malek (centre), President of the Malaysian Institute of Food Technology as Assoc Prof Dr Chan Hor Kuan (right), dean of UCSI’s Faculty of Applied Sciences looks on. A challenging programme, the study begins with an understanding of the biological and physical sciences as a basis for understanding the science of food with nutrition, as well as the relationship between nutrition and health. Students possessing an analytical, inquisitive mind who are interested in applying food science principles to further enhance the health and welfare of mankind, will beneﬁt greatly from this programme. The BSc (Hons) Food Science with Nutrition degree at UCSI University is designed to provide students with practical “hands-on” experience through a comprehensive and practical curriculum of cutting edge research and studies in food science and nutrition, the curriculum will not only enable students to gain pertinent knowledge and skills to work in the food manufacturing industry, government agencies, colleges and universities, as well as research laboratories, but will also equip them with good interpersonal communication skills and the ability to work in teams to solve multi-disciplinary problems. 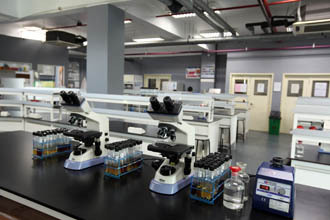 Under the direction and guidance of qualiﬁed professors and academicians, as well as experienced laboratory technologists, students are exposed to a variety of laboratory equipment and skills at UCSI University. 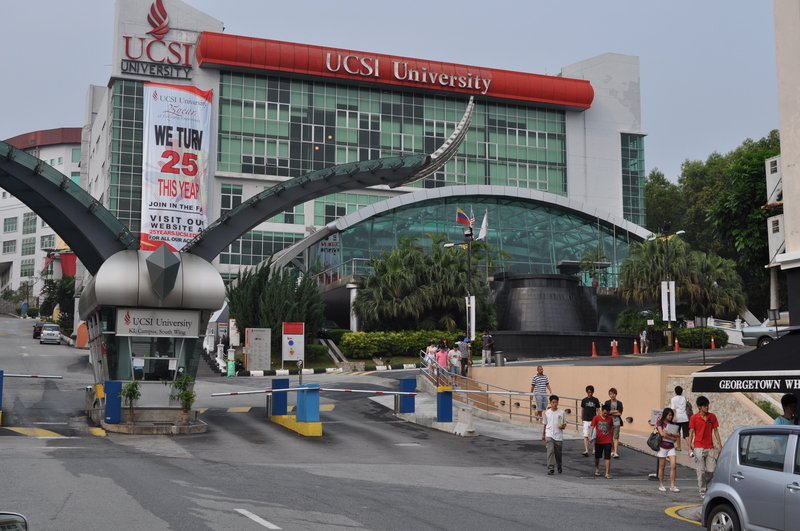 UCSI University is the first private university to offer the degree in Food Science & Nutrition. UCSI University’s Food Science team behind the Cofalle instant pasta, which clinched second place for the Innovative Food Product Development Competition. Well known for health sciences & engineering courses, UCSI University has achieved Tier 5 or Excellent Rating in the SETARA 2013. 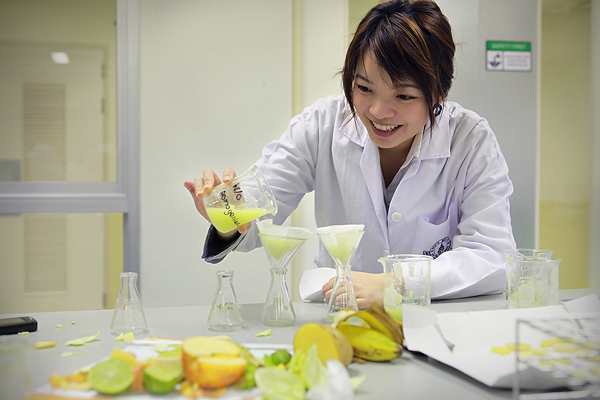 The top rated 3-year Bachelor of Science (Hons) (Food Science with Nutrition) programme at Taylor’s University offers students the opportunity to learn the science and technology of involved in food creation, processing and preservation, as well as the use of nutrition to improve human health. Students in Taylor’s University Food Science with Nutrition degree programme will be equipped with scientific knowledge to develop innovative, safe and healthy food products; the ability to advice and provide nutritional information for individuals; and entrepreneurial skills to set up food related business ventures in Malaysia and globally. Taylor’s University is one of the best universities in Malaysia for you to study the Food Science & Nutrition programme. Students after SPM or O-Levels with at least 5 credits including the relevant subjects may enter Taylor’s University Foundation in Science for 1 year before continuing on to the Bachelor of Science (Hons) (Food Science with Nutrition) programme. 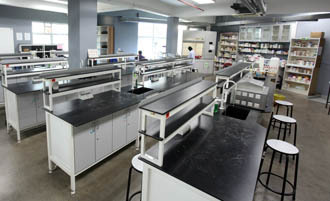 Through this Bachelor of Science (Hons) (Food Science with Nutrition) programme, Taylor’s University is able to produce graduates who can contribute to the research and development of new food products or add value to current food products and graduates can pursue careers as Dietitians, Food Technologists, Toxicologists, Nutritional therapists and more in the field of food sciences. Exposure to core food science modules, from microbiology to food chemistry and sensory evaluation. Exposure to the operations of food businesses via modules such as Food Preservation, Food & Nutrients Evaluation, and Food Safety & Quality Management. Comprehensive knowledge on halal food production via elective modules such as Introduction to Halal Food and Principles of Halal Food Business Management, which have been developed in collaboration with the Halal Industry Development Corporation Malaysia (HDC). Exposure to business and entrepreneurship via elective modules such as Introduction to Accounting, Introduction to Management, and Introduction to Marketing. Opportunity to work with industry on research projects related to product development, food processing and food safety. 4-6 months industrial attachment in the areas of food manufacturing and processing, nutrition science and product development. * The Ministry of Education (MOE) requires all students to take Mata Pelajaran Umum (MPU)(i.e. General Studies) which is categorised under U1, U2, U3 and U4 within the duration of their studies. U1 modules are prescribed by MOE whereas U2, U3 and U4 modules are from a list of University Core Modules (UCM) prescribed as per the Programme Guide. Established since 2009, EduSpiral Consultant Services helps provide information and counselling on courses and universities in Malaysia. EduSpiral Consultant Services represents the best colleges and universities in Malaysia offering a wide range of choices for students to choose from. These colleges and universities offer value for money in the quality of education and excellent facilities that you get. I couldn’t decide which university to go to after my UEC and talking to EduSpiral helped me make the right choice. Malaysia and affordable. EduSpiral provides in-depth information and counseling on their courses so that students are able to make the right choice.